Home Secretary Charles Clarke says the government will stand firm on plans to allow police to hold terror suspects without charge for up to 90 days. Ministers had been expected to offer a compromise deal, following fierce opposition from MPs on all sides. Instead a "sunset clause" will be added to the law, meaning it must be reviewed after a year. Labour MPs will be told by party whips to back the plan. The decision came after Tony Blair and Mr Clarke met Labour MPs. If the vote fails, senior Labour backbencher Janet Anderson will present an alternative proposal which will give MPs the option of voting for detention lasting 60 days. But speaking outside the Home Office, Mr Clarke said he believed Labour backbenchers will now give their support to the 90-day plan during a Commons debate on Wednesday. He said the government had offered a series of "concessions" to MPs, including oversight of the proposals by a High Court judge and the "sunset clause" which would give doubters the chance to review the situation after a year. "I believe the fact is there is a majority there strongly for the proposals of the government," he said. "I decided that a sunset clause, which meant that we would review the whole situation in the round, was the right way to proceed to meet some of those concerns. "At the end of the day, we are seeking agreement across the House of Commons. "The government's position is 90 days is the right period of pre-charge detention. We accept the police case; we believe it's a strong case." Mr Blair has said he does not want to give ground on the 90-day plan, despite the failure of inter-party talks. He said the measure was needed for national security. The Lib Dems want the maximum period in custody without charge to remain at 14 days, while the Conservatives are arguing for 28 days. Mr Clarke said he had decided not to compromise further after the "very strong support" given to the plans at a meeting of the parliamentary Labour Party on Monday. He also had a very strong feeling throughout the day that "this was the right thing to do". He added that there was now real disquiet among Conservative backbenchers over their party's opposition to the proposals. 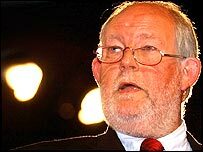 But shadow attorney general Dominic Grieve dismissed Mr Clarke's concession saying it "made a mockery of the assurances that Charles Clarke gave earlier". "It suggests a major split between the home secretary and the prime minister and it shows that the government has behaved with a degree of deceit in dealing with parliament," he said. Mark Oaten, the Liberal Democrat home affairs spokesman, said the 90-day proposal remained "unacceptable". "Last week the home secretary saved himself from total defeat by agreeing to reconsider 90 days," he said. "His refusal tonight leaves the Bill in tatters. Shami Chakrabarti, director of civil rights group Liberty, said: "The government's announcement is a triumph of party political machismo over rational policy making. "How will involvement of a High Court judge help when there are no charges to examine?" Labour backbencher David Winnick retabled an amendment calling for a maximum detention time of 28-days. He had withdrawn that amendment last week after Mr Clarke offered all-party talks, when it became clear the proposal faced a Commons defeat. It says those offences can be prosecuted in UK courts even if committed abroad. Terror laws: How long should suspects be held?